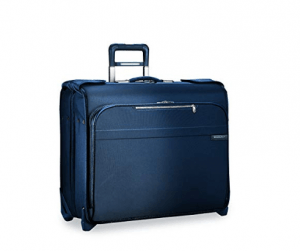 Navy Briggs & Riley Baseline is an imported deluxe garment bag with two wheels, and ballistic nylon fabric exterior. Style and performance is claimed to be in perfect balance in Baseline collection bags: “Engineered for quality and guaranteed for life” and “Versatility meets world-class endurance”. You have the polished chrome accents on the beautiful navy fabric as well as the high-end leather touchpoints. It has the honeycomb frame that is both lightweight and durable, flexible and retains shape. The 1680D ballistic nylon fabric on the exterior of the bag is great for withstanding dirt, moisture, wear and abrasion. The handle is located on the outside and you can fit in more stuff with more space inside. It will be easier to put your clothes in the flat interior and to keep your clothes free of wrinkles. The Baseline Deluxe Garment Bag weighs 12.38 pounds and measures 24 x 9.5 x 20 inches, and needs to be checked in before your flight as it will not meet the limit for cabin bags. The cushioned top handle is made of very solid aircraft-grade aluminum and can be locked at three points. The handle tubes are the sturdy and durable V-groove and you’ll experience much less jamming. The streamlined wedged feet and wheels are low profile and deviate the impact. There is a SpeedThru pocket for storing your items quickly at different security checkpoints. The gusseted front pocket is made up of two sections, the large one is for your clothes and the small one for your smaller items and includes a D-ring for the hanging hooks and a key keeper. Inside there is a zipped shoe pocket, a scarf and tie pocket, two mesh pockets and another zipped pocket. You can hang up to six suits with the two sets of Wally clamps. And the garment panels with the foam centers will cushion your clothes for as little wrinkling as possible. You can put your weird shaped stuff into the mesh corner pockets. Your garments will be maintained neatly with the detachable zip-in extender panel. There are no hangers inside but two clamp-in points next to each other. You can easily use the standard wire hangers as they’ll fit in well. You’ll find a fold-open panel for laying your winter coat over on your clothes. The Deluxe name is used for distinguishing this wheeled garment bag model from the compact Baseline garment bag. 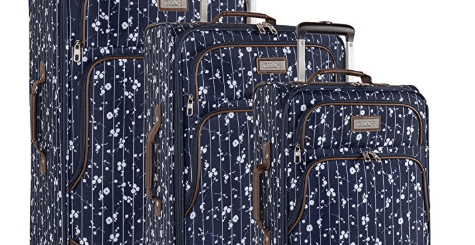 This deluxe model offers a lot of space inside and you can fit in 5 suits on the hanger, 8 shirts, t-shirts- jeans, a pair of shoes, and whatever you may need on your trip. This is not a low-cost bag by any means but you’re certainly getting what you pay for. It is a great quality bag with a lifetime warranty and superior customer support by Briggs & Riley that stands behind their products. Unless you select the “Conceal Package” option when you check out, the packaging will show the bag.